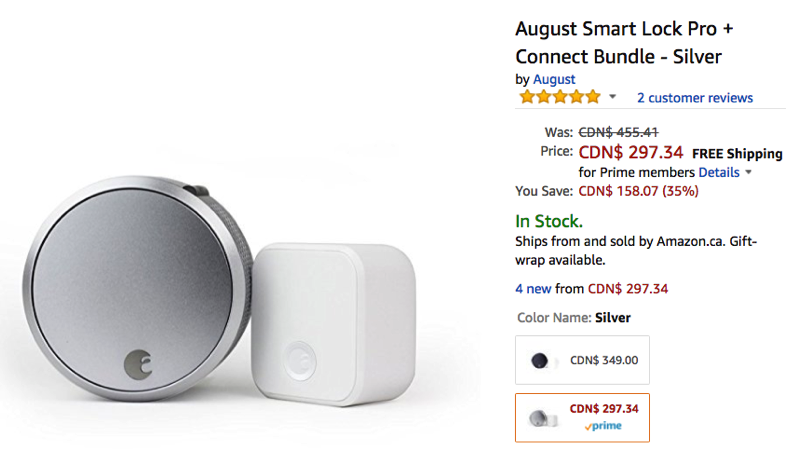 The August Smart Lock Pro + Connect Bundle (3rd gen) is on sale on Amazon.ca, for 15% off at $297.34, saving you just over $52, which is the lowest price ever on the site, according to price tracker CamelCamelCamel. Best Buy currently sells this for $349.99. The August Smart Lock Pro + Connect will let you lock and unlock your door remotely, while it supports Apple HomeKit, plus Alexa and Google Assistant. Included is the Connect Wi-Fi Bridge, which will let you lock or unlock the lock remotely, if you don’t have an Apple TV or iPad acting as a Home hub. Click here to jump on the August Smart Lock Pro + Connect bundle while it’s still in stock.